If anything, pregnancy has inspired me to be even cognizant about my health. So maybe I indulge in a few cookies too many from time to time, but overall, I’m happy with my fitness these past (almost) 16 weeks of pregnancy. Yes, I’ve been gentler with myself, but I’ve also been more consistent. Consistency makes me happier than sporadic intense exercises. After my 5K last Saturday, I was sore in places I’ve never been sore before. I tried running again the following Monday, but only made it half of a mile before giving into the soreness and heading home to grab Rascal so he could help me finish my walk. And then yesterday I surprised myself by running just under three miles with a bit of walking up the steep hills in my neighborhood. It’s amazing what your body remembers after not doing much more than walking for several months. In addition, I’ve been accompanying Brad to the gym some mornings where I stay on the elliptical for about 40 minutes and then do some light strength training (pushups on my knees, squats, crunches, bridges, and bench dips). If there’s anything I’ve noticed from a lack of running, it’s loss of muscle-tone in the backs of my legs and in my glutes. So doing squats on a regular basis, mixed in with a few lunges, has become important to me. If you like to read trash magazines like I do (don’t lie! ), you probably have read about celebrities using daily activities to get a little extra activity in their lives. While I’m fairly certain no one in Hollywood has ever gotten their body from parking at the end of the parking lot or taking the stairs, I’ve always been intrigued by celebrities who claim to exercise as they do housework. For example, did you know Audrina Patridge vacuums in high heels to work her calves? You won’t catch me doing that. I’m pretty sure I’d trip over the cord. But I have been trying to incorporate some light weight lifting into my housework. Mostly I do this while folding clothes, but other repetitive housework tasks this would work well with is packing the dishwasher or putting dishes away (i.e. every time you put a dish away, do five tricep kickbacks). 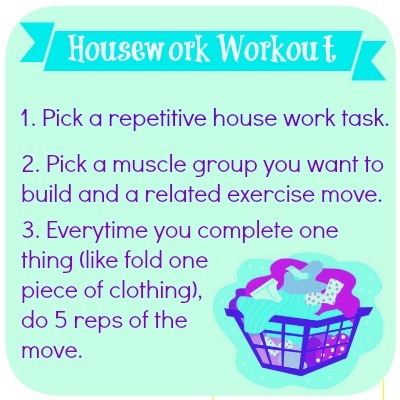 Obviously this makes the housework process take a little while longer, but it works well for me because I also get super bored when I strength train with no distractions. You could also do an alternative version with dusting where you do something a little more intense after dusting a surface, like burpees (yuck!). Because I’ve been picking up the pace a little bit with my workouts, I’m more confident about running the NC Biggest Loser 5K Off-Road Challenge. Trail running is so much more difficult than running on the street, so hopefully in the next week or so, I can work up to running up those hills instead of walking up them. However, I can say with confidence that I won’t be participating in the obstacles. I’m not pushing my luck. The folks from The Biggest Loser Run/Walk Challenge have offered a special discount to Foodie Fresh readers. Use the code FOODIEFRESH to get $5 off any Biggest Loser Run/Walk Challenge event (except Sacramento). These events are happening all over the country and you can find out if one is coming close to you by clicking here.